First, just look at her. Babs is beautiful in a way that few modern stoves are. Just like the stunning cars from her heyday, she’s all rounded edges, curved handles, and lots of chrome. That authentic vintage style is a truly gorgeous alternative to the ho-hum stainless steel, white, or black boxes that can be found in appliance stores today. And in my 1915 bungalow kitchen, Babs looks right at home. Beauty is important, but functionality is paramount. And Babs can do things that no other stove can. The In-A-Top broiler and griddle has been a game-changer for meals at my house. The griddle surface is ideal for anything that you flip to cook – fried eggs, pancakes, pork chops, grilled cheese – or huge amounts of food, like a double batch of Julia Child’s ratatouille recipe, which I make and freeze every summer. The griddle’s generous size is much larger than even my biggest pan, making quick work of any large recipe. Underneath the griddle is a broiler and sizzle platter, which has completely replaced my toaster oven for toast, bagels, leftover pizza, and anything else that benefits from a broiling flame. I once broiled a Christmas Eve leg of lamb on the sizzle platter; it’s also great for burgers and steaks, especially when it’s too cold to grill. If you cook bacon under the broiler, you’ll be rewarded with a delicious little pool of grease in the sizzle platter’s gravy well. That grease is absolutely perfect for slowly cooking a couple of eggs. I’ve also found Babs’ top pilot light to be surprisingly useful. It’s ideal for melting butter, keeping hollandaise sauce or gravy warm, or softening cream cheese for a baking recipe. I have a set of 3.5” stoneware ramekins that happen to fit perfectly over the pilot, and they retain heat quite well. Between the In-A-Top and the pilot light, I haven’t had any need for a microwave since I got this stove. Of course, Babs also has three regular burners, all of which are more powerful than those of any gas stove I’ve used before. The burners are perfectly sized for my most prized vintage kitchen tools, such as my 1910 cast iron Wagner waffle iron. My vintage Wagner waffle iron looks like it was made for this burner. In the center of the range is the pilot light. The Thermowell is directly behind the waffle iron. 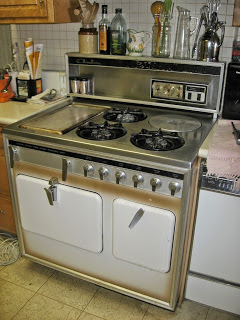 Before Babs came into my life, my biggest concern about living with a vintage stove was the size of the oven. It just looked so much smaller than a modern stove’s. But I’ve never once wished the oven was bigger. My years-old cookie sheets fit perfectly. Last year’s 12-pound Thanksgiving turkey had plenty of space (and tasted incredible). And since the oven is heavily insulated, you can actually cook with the gas turned off. I haven’t converted my recipes to cook this way yet, but it’s very handy for keeping a meal warm when dinner guests are running late. If I ever do need more oven space, there is a solution already built in: the Thermowell. Often called “the original slow cooker,” the Thermowell is a small, heavily insulated well at the back of the stove that can serve as a fast-heating oven or warming closet. Chambers used to manufacture sets of kettles that fit perfectly in the Thermowell. With a triple kettle set, you could cook three different dishes at the same time! I own a Thermobaker, which is a device that holds a casserole dish, pie pan, cake tin, or a couple of foil-wrapped baked potatoes. The Thermowell truly becomes a second small oven when combined with a vintage Thermobaker. I recently stayed at an Airbnb with a slick, modern, and likely expensive electric stove. It was the first time in a long time that I had tried cooking a meal on any stove other than Babs. The pans slid all over the surface. I had to press a button to get the burner started. I couldn’t tell when the surface had escalated from barely warm to screaming hot – or when it was cool enough to touch. The oven was comically large for the dishes I cooked inside – a total waste of energy. During that stay, I realized just how much I missed my Chambers’ gorgeous chrome handles and the satisfying sensation of turning them to light a burner. I missed the sound of the burner coming to life. And I really missed how consistent and visible the heat was, and how quickly it would be ready to use. I feel a bit sorry for the Airbnb hosts who purchased that brand-new, gee-whiz electric stove. I imagine that they were lured in by the range’s sleek digital presence, and by the idea that a new stove must be so much better than an old one. Well, when I was planning my kitchen remodel, I could have gone that way. I could have spent far more on a brand-new stove. I could have prioritized shiny newness over vintage charm. And I could have made do with just four burners and a huge oven, the way most people do these days, and I likely never would have known that I was missing out on so many other cooking possibilities. But I’m so glad I didn’t. In my mind, you just can’t improve upon the infinitely repairable, simply built, versatile, and gorgeous Chambers stove. THE LAST THING WE WANT TO DO for a client is replace their oven's thermostat. First of all, it's a high priced item: it can cost $500 and up for parts and labor, which can cause a client to trash the stove or have no money left for repairing lots of other items that would make their stove work like new. Secondly, thermostats are often unnecessarily replaced due to a rookie diagnosis by a so-called professional. I'm sorry, that's mean of me: a mistaken diagnosis. We receive many calls from clients saying that their appliance repair "specialist" inspected their non-working oven and determined that the thermostat is faulty, and since the part is no longer manufactured and not fixable, the stove should be replaced. That's like a doctor saying after a five minute exam that your pneumonia should be remedied with a lung transplant. the oven's burner won't light? the burner lights but the temp doesn't reach the dial setting? the oven temp takes a very long time to reach the dial setting? the burner lights and is more than 75 degrees over or under the dial setting? the oven dial won't turn, or is very hard to turn? the burner lights and the oven goes past 550 despite the dial setting? Of all the above, there is only one symptom - the last - that usually indicates an unserviceable thermostat. Affirmatives to all the other questions give hope that the thermostat is serviceable, or that some other issue may be the cause of the problem. Among the usual suspects: mineral build-up on the oven gas jet, insects inside the oven gas line, improperly adjusted oven gas jet, bent gas line, depleted lubrication of the thermostat valve. On ovens with safety systems: extinguished pilot light, bad thermocouple or poor connection to the safety valve, faulty safety valve, incorrect setting on automatic oven control, faulty servo valve. In 16 years servicing hundreds of stoves, we've only replaced two thermostats. All the other "bad thermostat" problems were usually far cheaper and easier to remedy than replacing the thermostat. Unfortunately, it does happen that occasionally, none of the alternatives check out. Which brings up the third reason why we hope a thermostat isn't DOA: it can be a big pain. Her oven had suddenly started burning the family's meals: right before Christmas. After running her through the gauntlet of questions, there was little room for doubt: her oven temp went through the roof no matter what setting. I was already booked for the entire week before Christmas, and she agreed to pay the premium price for after-hours service. Now began the hunt: hopefully we had a loose identical or compatible rebuilt or used T-stat in stock. Nope. Okay, hopefully we had a stove in the shop with a T-stat that might work. A late 50's Kenmore looked surprisingly good. "Surprisingly", considering that the client's stove was so different in era and brand. So the shop guys and I pulled the stove from its spot, prepped it for operation (they are typically semi-disassembled and need to be fitted with new connectors), and fired it up. It took awhile but I was able to get the thermostat's various functions into calibration. Fantastic: we now had a used thermostat to pull for the job that I knew worked and was already spot on. But in having a final look at my client's photos, I realized I couldn't fully see the connection behind the T-stat body to the oven's gas tube. When she sent better photos, it became sickeningly clear that the Kenmore's connection was not in fact compatible. All that time with the Kenmore - wasted. Next strategy: check out all the other stoves in our off-campus storage. Fortunately we photo archive any stove we acquire so that we can "remotely" inspect their components on the computer, and of course the most likely prospect was our oldest Roper, a dual oven: it was still of a more recent vintage than our client's Roper, but its T-stats looked practically identical, including the proper connection. The twin ovens were a plus: since we had already spent so much time on the project, we didn't want to drag this stove to the shop in order to set it up and test the T-stats, so we'd yank both T-stats to bring to the job, and have a good chance of one of them working. On the "unfortunately" side of things, this Roper was crammed in the back corner of a cold, unlit room with lots of stoves, so we had to remove half of the stoves in order to get to it. On the "fortunately" side, by disassembling it to remove its T-stats, I'd have the process down when I showed up at the client's door: Always good to anticipate a cherry pie hiding among the pits. I spent about an hour at the shop cleaning the thermostats, packed up all our service tools and supplies, and headed out, confident that for this particular job at the end of the day, I had covered all the bases. Lot's of prep work on this one, way more than usual, but at least the overtime fee I'd be charging could make it worthwhile. If only I had noticed that the client's photos clearly showed that her thermostat had a very different connector for the pilot line than what our T-stat had, because it wasn't until I had spent about three hours at her house testing her thermostat, tearing it out, then installing the replacement, that my own rookie mistake was exposed. Some night it's cherry pie, other nights it's humble pie. And the topping? Instead of whipped cream, it would be telling the client that because no repair had been accomplished, I would cut the overtime fee to my regular rate, and come back with the solution before the new year's holiday (to which she had re-scheduled her family gathering). Adding to my humiliation was realizing the obvious fix: by simply hacking off the end of the pilot line on our stove in storage, which had the proper fitting, I could have then joined that 3/16" tubing to the client's 3/16" pilot line with a "union" fitting. Simple. But "simple" wasn't in this card game in the first place, and wasn't about to show up just anytime soon. To wit: on the morning of the follow-up service call, I figured I could save time and avoid returning to the storage space, pulling out 6 stoves, and hacking off the needed connection, by instead purchasing a 3/16" flared nut (common on old car brake systems) at a random auto supply store on the way to the job, even though I knew the one particular auto supply store with old-timey brake part fittings, in the opposite direction of the day's jobs, might be the surer, safer bet. Well, you guessed it, the random store didn't have the 3/16" flared nut, and I'm already running 30 minutes late. A call to the client to inform of the delay, and I head to the old-timey shop in the opposite direction. And no, they didn't have the nut either. So to the storage space I go, yanking out all the other stoves in the way of the Roper. Exactly WHY hadn't I placed the other stoves in first so the Roper would be right there when I opened the door? Hack off the pilot fitting. Shove the stoves back in. (Don't even ASK where the Roper ended up). Another phone call to my client for the now 2 hour delay and I'm a dangerous projectile hurtling toward the suburbs. Finally arriving, I was hopeful that I had crossed my T's and dotted my I's, yet quite aware that things weren't going the way that I had hoped from the get-go. One hour after arriving, the original T-stat was out, and I was comparing the two side by side from every which way: Centering of the control dial axis: check. Length of the body from the center of the manifold mount to the front: check. Distance between the centers of the two mounting screws: check. Everything seemed okay, and I proceeded to install the replacement. First was threading the thermostat's sensor through the top of the oven jacket for placement inside the oven: a delicate task due to the frailty of the very thin copper capillary tube that connects it to the thermostat - one small crack and the T-stat's toast. Next was inserting the two mounting screws into the T-stat body. This is where things got very interesting (It's often handy in front of a client to replace the urge for emitting loud curse words with the thought: "very interesting". It seems to be the better choice for maintaining their confidence). It was clear that the mounting screws for the original thermostat were slightly thicker than the holes of the replacement. How very interesting! Did I bring the thinner screws from the other thermostat? Well of course I did but I couldn't find them at the time, which was also "very interesting". Luckily, before my head exploded from self contempt, I realized that the thinner screws wouldn't help anyway because of course the threaded holes in the manifold were too big for the smaller screws and by God I'd just have to figure out some way to deal with the problem, which did NOT include coming back with another thermostat. How very very interesting, goddammit. Turns out the screws, when inserted into the widened holes, did not project out of the bottom of the holes, which was necessary for them to screw into the threads of the manifold. This made it suddenly clear that the body of the replacement T-stat was thicker at that dimension then the original. This was no longer the least bit interesting. And of course whenever I need my Dremel tool, I usually fail to bring along my Dremel tool. Suffice it to say that my Dremel tool would have been very VERY handy in this situation. At this point any and all further "interesting" inconveniences would be dealt with a large hammer. Backing off that mind set just a skosh, I selected a large drill bit, inserted it in my drill, and bored down into the soft aluminum about 1/4". Not pretty, but it did the job. Tightened down the screws, attached the oven gas tube, and the joining of the two pilot lines with the union went swell. Turned on the gas, applied soap solution to all new connections yielding no soap bubbles, so no leaks. Fired that thing up, set the dial to 250 and in ten minutes the temperature plateaued at about 175. Hallelujah! Within 30 minutes all adjustments had been made to get the temp spot-on with the dial, and the bypass flame, pilot and other T-stat functions were more than happy. All was as the Roper gods had intended when this stove shipped out of Rockford, Illinois about 80 years ago. Not all 7 1/2 hour service calls take the same amount of time to prepare for, thank God. Most take between 30 to 60 minutes. Occasionally, however, the needs of a vintage stove can push your friendly service technician to extremes. So when you require help for that 3/4-century old stove which hasn't required a dime for repairs all the years that you've owned it, please grant some understanding when we charge a service fee to show up at your door. We have probably earned it. Have you ever been to Cincinnati? I simply love the place, specifically the "Over The Rhine" area, also know as OTR. It's were my dad was born, and was our family's summer road trip destination for many of my early years. For decades Cincinnati's perch on the Ohio river made it the Gateway to the West for immigrants using water highways to make their way from the east coast to lands beyond the Mississippi. Its frontier port town identity is reflected in dense concentrations of 1800's architecture. 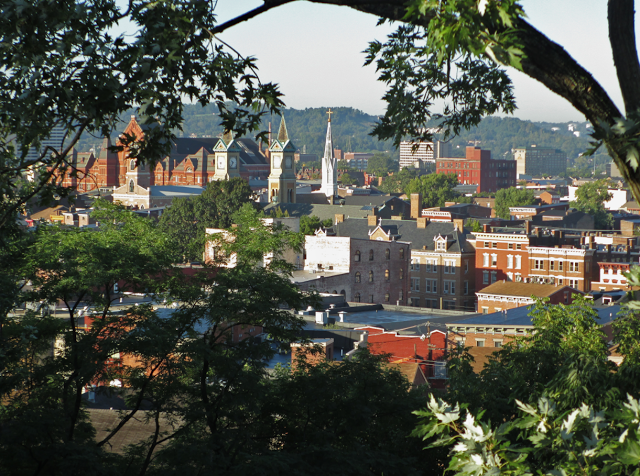 Seriously detailed and colorfully painted residential and commercial brick buildings cling to steep hills overlooking downtown and the beautiful bridges spanning the Ohio river. Yes, this bridge should look familiar. The John A. Roebling Bridge, 1867, was the practice run for the Brooklyn Bridge, completed in 1883. The steep grades of many Cincinnati streets puts the fear of God into any flatlander driving a stick shift. My aunt loved to ride her (1 speed!) bike on those hilly streets as a kid, and cried because her over-developed calves inspired some schoolmates to tease her for having boy's legs. Considering all the contributing factors, my love for the Queen City is unavoidable: besides the great combination of landscape and architecture, it's also home to a large number of both my mom and dad's ancestors, who I have researched back to the 1830's. The pleasantly particular accent of its denizens is a spin on "Southern" unlike anywhere else in the South. The influx of skilled craftsmen during its heyday, along with plenty of the required natural resources, enabled art to flourish in Cincinnati. Its museums are spectacular, showcasing local murals and ceramic works of international prominence, including Rookwood pottery, which points to the prominent role women had in Cincy's nascent art scene. Cincy was also an early incubator of the Arts and Crafts movement, and has some stunning examples of Art Deco themed buildings. When in Cincinnati, DO NOT, under any circumstances, omit a visit to the Union Terminal train station, a high holy temple of Art Deco. Although it's closed right now for renovations, it's definitely worth a visit to experience the grandeur of the building's exterior and grounds. Then there's Cincinnati's singular food and drink: Skyline chili, Goeta, Graeter's ice cream, and, mmm - beer. OTR was the original center of the lager beer universe, and is making a spectacular comeback due in no small measure to - you guessed it - beer! (See my link page and praise for the book When Beer Was King). Yeah, so there's all those things that are great about Cincinnati. Ultimately though, what really motivates my wife Kathleen and me to finally pack up and drive the 5 hours isn't beer, architecture, or cute little hot dogs with chili and cheese - really really tasty hot dogs, chili and cheese - oh they are so good. No, actually, it's our love for our friends Steve and Denise. Denise's smile would light up the darkest vault in a mausoleum at midnight, and her singing would bring the inhabitants back to life. Steve is a master restoration builder, passionate about preserving the genius of Cincy's old world craftsmanship. Much of what he's seen throughout town he's distilled inside their home, with brilliant color choices that makes it a four story religious experience. Steve's hand-made hinges, rounded plaster corners, high, sculpted baseboards and other details all attest to his skill, knowledge, and reverence for the artisan craftsmen that rendered Cincinnati into a unique and rich collection of architectural treasures. So I guess that it's really no surprise that it was in Cincinnati, in Denise and Steve's home, back around 1998, that we first laid eyes on a Chambers stove, their baby blue Model C.
It was awe and lust at first sight. Besides the sheer beauty of the dang thing, part of the draw was the mystery of it: where did it come from? How did it work? No one really knew. Supposedly it was made out of cast iron and had a brick-lined oven that let it cook at 1000 degrees, and it could even cook without the gas on. 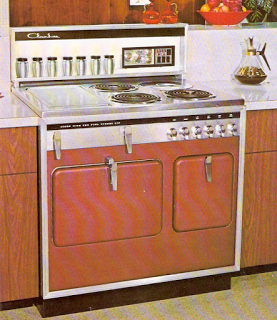 All that we knew for sure was that we loved those tear drop handles, the sensuous curves, the deep golden glow of the timer and oven dials, and the chromium blue pattern of the cooktop flames against the deep black porcelain drip pans and burners. A few years later, when our post-infant son started crawling around the sticky floors of our decrepit kitchen, we coughed up a fur ball of dough to start remodeling. We weren't really considering a Chambers: for all we knew, Steve and Denise's was the only one in the world (note to digital natives: This was before the internet). So we started looking at new stoves, and were immediately, thoroughly underwhelmed by bland looks, shoddy construction, and a weirdly slimy feel of touchpad controls. Although it may have something to do with the fact that Steve designed the layout of our kitchen, my wife and I decided that no way would the shadow of a new stove ever darken our front door. 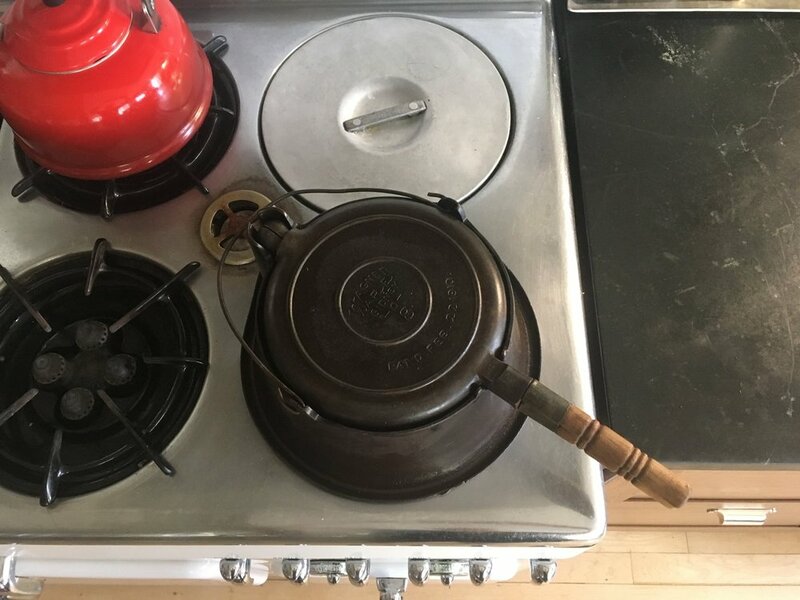 We asked our Cincinnati friends to keep their eyes peeled for an old stove, and if it were a Chambers like theirs, well, it wouldn't exactly hurt our feelings. Turns out Steve recalled that he had helped a friend move into a house 20 years previous, and he was pretty sure there was a Chambers in the basement. He called the friend and the stove was still there, unused since the move, and it was indeed a Chambers, an older, white model B. In a blink of an eye Kathleen and I were in Cincy with the minivan, to pick up some Coneys and the stove, er, the stove and some Coneys. Soon afterwards, the Model B was in a heap of parts in my basement shop. More about that later. I tell this story practically every time I do a Chambers service call, so why not just put it in my blog for the whole world to see? Denise and Steve, thanks for welcoming me into your "neighborhood", and for introducing me to the world of Chambers stoves. I know that I am but one of the hundreds of people who have been inspired by the love and creativity you two surround yourself with, and radiate from every pore. Seeing the beautiful kitchen settings that many of my clients build around their Chambers is one thing I love about my job. Often I will yank a stove in the middle of demolition, with dust and mayhem swirling around my lungs and mind as I'm driving away with the stove on the way to the shop. Man I wish that I'd been photographing those demos… They can be so gawd-awful, and so entirely different to the scene I return to with the repaired or restored stove. Most of the settings I install Chambers in are vintage, and most of them are visually busy. That's why I like the stark contrast here, in my client's small cottage in Lake Geneva, Wisconsin. Compare this with her brother's place below. A modest and elegant setting, brilliantly remodeled with vintage steel Geneva cabinets in a Chicago two-flat. Tom and Nancy are both fantastic artists. They own a nice Model C low back in their funky Chicago bungalow. The stove shot is nice but heck with it, I love this shot so much better. Joe with his pride and joy Model C, in a great original vintage "sunrise" kitchen in Elmhurst, Illinois. This gorgeous space - in a similarly gorgeous Arts and Crafts home in Glen Ellyn, Illinois - was created by my friends Jim and Deb. Does it surprise you that they are designers? The place that inspired this post: I was working on Mark and Michelle's Chambers in Lombard, Illinois while big guys were ripping out the floor and wall around their wonderful farm sink. On returning, I found the sink surrounded by clean symmetry, facing their model B blacktop shown below. The presence of the yellow drapes, bowls, plates and tea kettle is so slight, yet so awesome, it totally knocks me dead. Mommy, I WANT THIS KITCHEN!!! To the right is another Model B with black porcelain top and handles. Ironically, this was the cheapest version of the model, yet the black top and handles create such great accents in white kitchens, this one so very nicely done in Mequon, Wisconsin. On a slim budget? Here's an instance of how a Chambers can BE the rehab in an existing, non-vintage kitchen. My friends Eric and Emma simply dropped in Baby Blue (which Eric helped me restore), then cleaned the cabinets, painted the walls, and added furniture and dishes that riff off of the stove. In my humble opinion, they got themselves the best dang kitchen in upstate New York, Millbrook, specifically. I couldn't put two more starkly different photos together than the one above and the one below. My Munster, Indiana client loved her Chambers cooktop but needed to do a total rehab for her elderly mom's kitchen. Normally I prefer color but I gotta say that this contemporary monochrome treatment incorporating the vintage cooktop is quite attractive. Finally, check out this gorgeous mint green Model BZ in a quaint cabin in Three Oaks, Michigan, near New Buffalo. First time I've ever seen a BZ in other than white or yellow plumage. Next to that brick chimney with that yellow faux lure… Mmmm mmm! That's a-nice! Many of us, especially in the south, choose not to have our cooktop and ThermoWell pilots going in the summer. It really cuts down on heat in the kitchen. Extinguishing the pilots at summer solstice, and relighting at the fall equinox, can put Chambers owners in touch with the seasons. Remove the grate and drip pan from the front left burner. My finger is pointing to the flash tube. Lift its tip off of the burner body in order to get better access to the control valves for the cooktop and ThermoWell. The valves, shown at left, are small brass bodies attached to the stove's manifold (gas supply pipe). You may have to go through the right REAR burner opening to access the cooktop pilot valve. With a medium to large screwdriver, turn the cooktop valve clockwise to reduce and turn off the pilot. The valves may be "frozen" if they haven't been serviced. If so, gently but with some force turn the screwdriver in one direction, then the other, many times until the valve starts to turn. Now turn the valve gently clockwise until it stops. The pilot flame should be out and you should not smell any gas. Repeat the process for the ThermoWell. Open up the service compartment door, and to the upper left you will see the pilot valve heads (yellow arrow). Sometimes it's a filter with two screws, other times it's a filter to which the pilot valve assembly is attached. The upper screw head is for the cooktop pilot, the lower is for the ThermoWell. Adjust as described above. Of course when fall comes around we reverse the process, and experience a giddy sense of awe at simply turning a lever and having fire magically appear! How incredibly awesome and convenient! Some would argue that a Chambers range with two pilot lights going is not efficient or environmentally friendly. I respectfully disagree. During the winter, whatever heat those pilots are putting off are taking load off the furnace for warming the house. As a Chambers owner, you already know how fabulously interesting life can be. Make it even more so by getting in touch with the rotation of the planet by the seasonal extinguishing and lighting of your ThermoWell and cooktop pilots! TECH TIP: The proper height of you cooktop pilot flame is about 3/4". Shorter is fine, as long as it still easily lights your burners, and stays lit with whatever drafts exist in your kitchen. Same for your ThermoWell pilot. Whatever it's height, you don't want to have any orange in the tip of the flame. That indicates incomplete combustion, creating excessive carbon monoxide that may cause an unpleasant smell, and gives some people headaches. KEEP THE TURKEY OUT OF THE CHAMBERS? Heretical as it may sound, it's my belief that the best way to use a Chambers for the Great Turkey Day is to save it for all the miscellaneous baked sides: pie, potatoes, extra dressing, biscuits, etc, etc. Though I truly worship a Chambers turkey cooked in a Lisk or Reed roaster, the logistics of lots of people to feed with lots of baked items puts a squeeze on the ol' fireless range. Fortunately, there is a more than adequate solution: the fantastic Nesco Electric Roaster. My advice, of course, is to look for a vintage Nesco, just to maintain the aesthetic. Easily found at estate sales, Goodwill or other thrift stores, or online on Craigslist or Ebay. I think the old ovals are very cool looking, but most often you'll find them in a rectangular shape, plenty big for a 20 lb. turkey. A Nesco Deluxe Roaster with Timer Clock. One of their fancier models. Vintage or modern, these countertop cookers do a fabulous job on Tom Turkey while keeping the Chambers free for other things. That's how Tillie (grandma Oliver) did it throughout my childhood. Man, the smells are wafting through my olfactory as I type. Tillie's children, grandchildren and great-grandchildren still do it that way. Some are fancier than others, such as the Deluxe with Timer Clock. These can be programmed, er, excuse me, pre-set, to start and stop at desired times. If you are lucky you'll run into one with it's own rolling cabinet so it doesn't take up any countertop space. My oval Roastmaster, shown at right, has a simple temperature knob with indicator light. I love it. Like a Chambers, they're well built with little to go wrong. Make sure it comes with the wire rack to place the turkey on: it keeps the bird from directly contacting the bottom, and makes it possible and safe to lift the finished bird out in one piece. Nesco's often come with cool nesting containers for cooking items separately from each other. The original manuals are very useful and often entertaining (possum recipes, interesting narratives on domesticity, etc.). Nesco nesting pots, which fit inside the oval roaster. The usual fix-up for them is to replace their frayed, brittle power cord or a knob, easily done at your local Ace Hardware. Just bring in the old one for reference. With your cool looking and ultra practical vintage Nesco roaster infusing your home with saliva-inducing aroma while turning tom turkey into a golden ball of protein, your Chambers oven is free to take on all the other goodies. Holiday stress? Thing of the past. Sometimes your own fabulousness is hard to ignore. This time - just before the baking holidays - would be the time to make sure your Chambers is operating at peak. You will enjoy your Chambers so much more when it's adjusted and lubricated to operate and perform the way it was meant to. Contact us to schedule an inspection and low cost tune-up. And check out this vintage video of a Westinghouse Roaster! 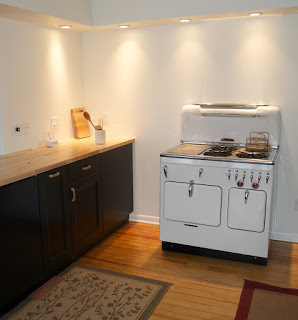 VINTAGE STOVE OWNERS ARE AS NUTS AS VINTAGE PARACHUTE ENTHUSIASTS! If you are a flaming anti-vintage-stove fanatic (I did NOT plan that pun. Wish I had), I have no idea how you ended up here, but since you are, let me guess on the reasons for your viewpoint. I'll make this as quick and painless as possible. Your issues with vintage stoves probably center around three things: it's unsafe, it's far less efficient, the oven is too small. I cover safety elsewhere, as well as the insanity of granting "Energy Star" ratings to ranges that in 10 years will end up as metallic chips being shipped back to China to be re-formed into brand new "Energy Star" appliances, then shipped back here. For now I'd just like to start by backing up a bit up and getting one thing out of the way: the overall negative connotation surrounding "vintage". As in "Ma! Ya got a vintage stove! I'm gonna get that clunker outta here and get ya a modern stove." Vintage meaning "old" and Old = Bad? With parachutes, medicine, diapers, a gallon of milk, I'm sure we all agree: old is bad. What about wine, cheese, Mozart, a '66 Mustang GT, the Grand Canyon? Picasso? You would never discard any one of them out of hand, just because they are old. Dear old Ma might be a pain, but where would you get Ma's chocolate chip cookies from, without Ma? So we're agreed? Old can be good? Great. Let's move on to efficiency. It's not a myth, it's simple math: the energy efficiency of a Chambers compared to other gas stoves is off the charts, easily understood by pointing out a few numbers. First and foremost: R value, the capacity of an insulating material to resist heat flow. We are talking massive R value here from the mineral wool insulation - the same stuff used to insulate kilns - that is densely packed into the jacket surrounding the oven (and ThermoWell). 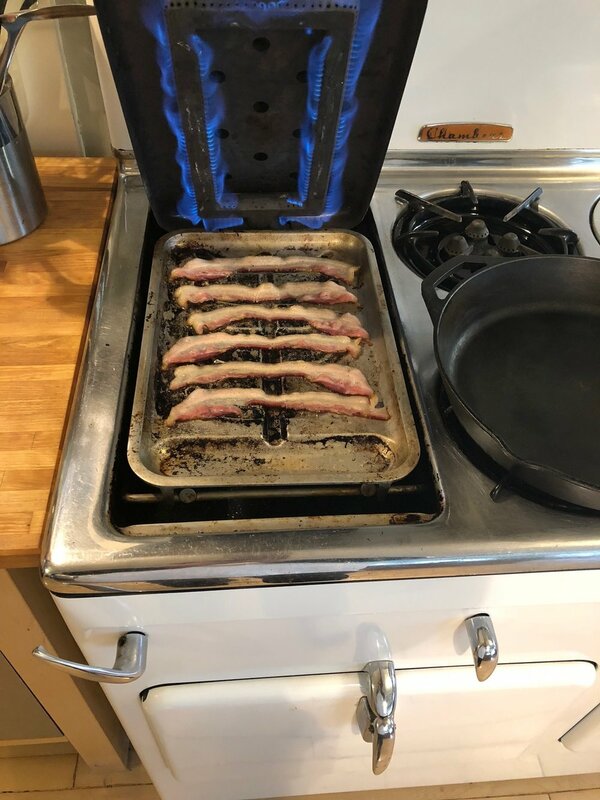 No other stove has this. Even when a Chambers oven is used conventionally - just turning the gas on and letting an item cook - very little gas is needed because the densely packed mineral wool prevents the heat from passing through the oven walls, far better than a thin layer of fiberglass used in other stoves. Utilizing the Chambers Retained Heat cooking feature ratchets up the thermal efficiency to an even greater degree (No, really, that just slipped out. No pun was ever intended). Normal ovens have a "passive" inlet and exhaust system, basically holes in the floor and sides, which creates the air flow necessary for the process of combustion. This flow of cool air into conventional ovens occurs all the time: it cannot be stopped. Even when the gas is turned off, as long as the air in the oven is warmer than the air outside of the oven, the flow continues, rapidly cooling the oven. A Chambers, however, controls the airflow via an "active" airflow system. When turned on, the oven's "on/off" lever opens inlet and exhaust flaps. When turned to "off", the flaps close. Cool air can't enter, hot cannot escape. This sealed, highly insulated thermos is what makes retained heat cooking possible. Chambers marketing materials claims that CWTGTO uses about 1/6th of the gas of a conventional oven. The third gas saving measure of a Chambers oven might be the least obvious, but it is quite significant. It's actually shared by most stoves made before the mid 1960's: the small size of the oven. A Chambers oven measures 18" deep, 18" wide, and 12" high. The volume works out to only 2 1/4 cubic feet, compared to modern 30" ranges, with 4.2 to 5.8 cu. ft. So with less than half the volume of the majority of today's stoves, it's no wonder why this is the foremost "deal killer" objection I hear about keeping or purchasing a Chambers. But think about it. Is the "small" oven really a problem? Or is it a misconception? Consider all the times your oven has been used in the past year. Of them, how often has it been heated up to warm, bake or roast a small item? Think about how much gas and time it takes to pre-heat that large oven, how much gas it takes to keep that huge oven hot in order to cook a small item? How few times have you actually used it's total capacity? How much space do two or three cookie sheets take? How about a pizza? A large turkey roaster? The "small" Chambers oven can handle them all. You see where I'm going: the "small" Chambers oven requires half the gas, and can easily handle 90% of items put into a "normal" oven in the course of a year. So if it covers most of our needs, why call it "small"? If a "normal" sized oven covers so few of our needs, why call it "normal"? How about we change "small" and "normal" to "optimal capacity" and "extra capacity" to get a better sense of what's going on. A Chambers' "optimal" oven has enormous energy saving benefits over an "extra" capacity oven due to faster pre-heat and less gas volume required for pre-heat and for cook time. Add to that the Chambers' mineral wool insulation, active air flow controls, and the thermal mass of its cast-iron oven bottom, and you can see how a Chambers' oven makes total sense, not just for responsible stewardship of our environment, but for practical, convenient, everyday use. When buying a car, we make very conscious decisions around optimal use, and purchase accordingly. Regarding size, sure, a full-sized van might handle any and all needs for however many people or things we might need to move from one place to another, but most people don't need that capacity every day, and/or are unwilling to pay for the extra fuel it consumes. Does it make sense to own and use something every day that uses so much fuel, if we only need it's capacity once in awhile? Why not look at stoves the same way? For the times when extra capacity is needed, check out my post of 11/9/15. Of all the features Chambers offers, most of the calls I get concern the In-A-Top Broiler/Griddle. And of those calls, the most common question is "My griddle is disgusting! How do I keep it clean?" Well, "Clean" is a relative term, and like Beauty, all in the eye of the beholder. Let's start with the Model B we've got in our kitchen. Bacon and pancakes has always been our son's favorite breakfast. He's 14, so I've been cooking that meal on that griddle about twice a week for over a decade. Plus, I'm always using the broiler for roasting red peppers, eggplant, zucchini, and occasionally animal flesh. The griddle, broiler and burners of a vintage Chambers stove model B, as well as the folding cover. Not exactly pretty, but since I use it so frequently, and the rest of the cooktop is in original (well-worn) condition, I'm fine with how it looks. Now check out the griddle of my friends Tom and Nancy. I think Tom and Nancy don't just cook on their griddle: they must live on the darn thing. When I first worked on their stove and offered to clean the griddle, I was blown away when they declined. They didn't just say "no": they were adamant that I not touch it. They love it just as is. Then there's my buddy Jim. Believe it or not, THIS griddle isn't new: Jim and his wife have been cooking on it for themselves and their kids, keeping it this good looking for almost a decade. How do they do it? More on that soon. My point is, every Chambers owner perceives and likes things different. Depending on one's tastes, the condition of the cooktop, how one cooks on the stove, etc., it's hard to give out a single line of cleaning advice that applies to everyone. So, I'll offer maintenance suggestions for just a few situations and hope that satisfies most of anyone looking here for help. If you REALLY hate to clean, you couldsimply own what we in the biz call a Stealth: a Model A, B, or BZ with a black porcelain cooktop instead of chrome. All six versions of each model sport a nifty folding cover: when done cooking, it folds down to conceal not only the griddle, but the entire cooktop, hiding lax maintenance from view. The three Stealth versions go one further: the black cooktops do a great job of making blackened, baked-on surface grime practically invisible. How awesome is that? With filth thus concealed, hubby would be none the wiser that his lovely house spouse, in crisp pressed apron serving canapés to his dear old mother, was literally a slovenly Mrs. Hyde. 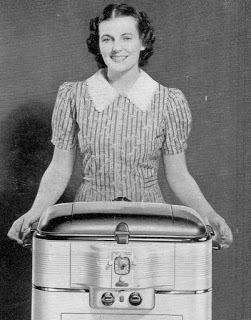 All that changed with introduction of the model C in 1949, when Chambers deprived deceptive cooks of their easy outs: the folding cover AND black enamel cooktop option were gone. 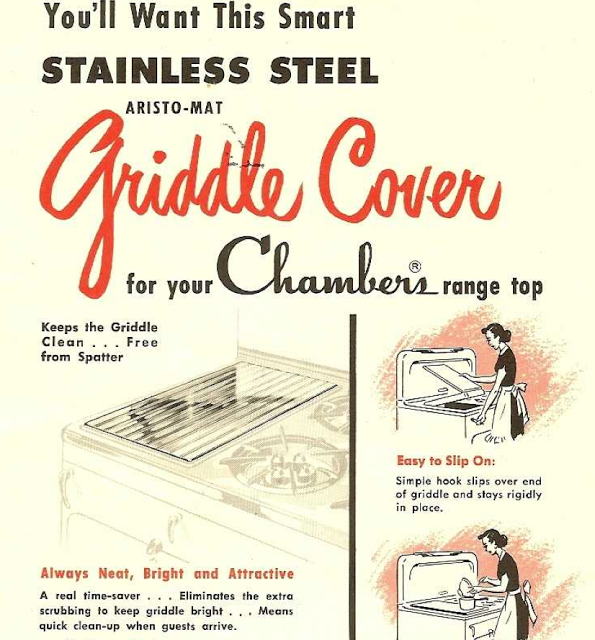 The "Aristo-Mat", a skimpy little sheet of stainless steel to cover just the griddle, was all they were left with. Sure, it did its job, but the rest of the shiny chrome cooktop was now 24/7 open to scrutiny. No wonder female angst was about to explode in the Women's Liberation movement the next decade. Yes, Aristo-Mat covers can still be found, but they are almost always pretty beat up. Better than nothing, I suppose, in the same way as a bad toupee. So what's a Chambers house spouse to do, now that it's 2015? The icecaps are melting, people actually think a rich reality TV personality should lead the hope of the free world, and we are still worried about what our Chambers griddles look like. Are we geeks or what? Just gotta go glitzy? Fine, but you must first get your griddle polished, by a professional. Don't do it yourself: you are not good at it, and it involves dangerous machinery. Send it to me: I'll take out all the dents and warpage and return it looking brand new. As for maintaining the shine, I have absolutely no clue, because I've never practiced that religion. I'm am sure one should not touch it with metal utensils, abrasive pads or scouring powder. Actually cooking on it? Probably a bad idea. Restored Vintage Chambers stove model 90C highback set in a vintage kitchen with subway tiles and cork floor. Yes, my friend Jim says that he uses his griddle all the time and it somehow emerges from the sink as shiny as the day it was polished, but c'mon, look at his kitchen: I'd bet that every speck of cooked food in that house has been delivered. I like Jim and trust him on everything else he tells me, but we all have one dark secret so I let him slide on this. For those with newly re-chromed cooktops and messy and/or lazy kitchen habits, you may want to go the way many of my clients have gone. Opt for two griddles: a working griddle for actually cooking on, and a polished "show" griddle, never to be cooked on, kept for when judgmental company or in-laws come over. This might seem excessive to some, but if I had a re-chromed cooktop, I'm not sure I could stand having a work-a-day griddle sullying up so much prime real estate while the stove was idle. For the majority of Chambers owners with original condition cooktops, a spangly griddle might have the lipstick-on-a pig-effect, making the rest of any work-a-day Chambers look worse. So be content with your one working griddle. It's really fairly easy to keep it clean by doing what the Chambers owner's manual suggests, with a slight revision. The manual's basic philosophy is to clean the griddle after every use, while it is still hot. Not blazing hot, right off of the fire, but hot enough that you definitely need hot pads to take the thing off and set it in your sink filled with dishwater. The manual suggests using Brillo pads, but I've found 3M Scotch-Brite scrub sponges to have the best balance of scouring/polishing qualities: The yellow sponge portion of the pad holds plenty of dish soap, while the green scouring portion of the pad is aggressive enough to abrade off most hardened or semi-hardened grease from the griddle. Yet it leaves the aluminum smooth enough so that the "seasoned" quality of the surface remains, ensuring that eggs, pancakes and the like won't stick. (Of course you still need some sort of fat, in or under whatever you are cooking, to keep it from sticking). This method, or at least the half-hashed way I go about it, never gets every spot off the griddle, and eventually, just like the cooktop surface itself, the grunge spreads and builds up. Once or twice a year, fed up with how disgusting it all looks, I turn toward modern chemistry to make my life as a Chambers house spouse more meaningful and rewarding. Easy-Off oven cleaner is the way to go. Not the nasty stuff in the yellow can: that Alien blood works fast but is so noxious and scary you don't want to mess with it. Protective clothing? I'm thinking Haz-Mat gear. The Easy-Off you want is the one in the blue can. It works a lot slower, but it is very low fume, so one may actually inhabit the house while it's working. And yes, wear rubber gloves, safety goggles, long sleeves etc. Stick your griddle in a plastic garbage bag, spray it down with the product, then close the bag to let the griddle soak (the stuff only works when it's wet), from two hours to overnight, depending on how crusted your griddle starts out. Add the action of the Scotch-Brite scrubber, and you've got your nice clean griddle back! You will have to re-"season" the griddle at this point because that layer of fat has been chemically and physically removed from the griddle's surface, but that just requires you to cook a mess of bacon (or moderately heat the griddle after rubbing in some Crisco or bacon grease). When using Easy Off in the blue can, remember that the less time the better, because the cleaner tends to turn exposed aluminum grey. Do not let the stuff dry on bare aluminum: that's really hard to clean. Now, for those of you who never clean your cast iron pans, don't want to use any chemicals, or have opinions around aluminum contacting your food, you can do what my buddy Tom does: never clean your griddle. Well, never thoroughly clean your griddle. I can't imagine such an approach to cooking, but I've seen enough blackened griddles to know that plenty others can. Layer by layer, meal by meal, the grunge gradually coats the aluminum to the point where it looks like cast iron, and probably weighs just as much. Who cares what your judgmental friends and relatives think? It's been ages since they swore off coming to your house for dinner anyway. Since first laying eyes on Chambers' visual tragedy many years ago, I've been loath to grant the Model D any respect. Aesthetically, if such a word even applies, I consider it the Edsel of the Chambers brand. After decades of minimal changes to a warm, timeless design, the folks at Chambers seem to have taken a flying leap into steely cold Bauhaus pop. Well actually, likely NOT the folks at Chambers: my friend Todd White, keeper of the Chambers Stove Lovers website, writes that Rangaire had taken over by 1964. So the new owners probably felt the need to make their mark. Just like dogs make their marks on trees, if you ask me. There might be uglier stoves out there, but considering how nice looking and un-gimmicky Chambers stoves had been for so many years, even the plainest model D gives me a headache. Then there's the top of the line Stainless Steel and Ivory Imperial shown here, trimmed with airbrushed Avocado. It simply shocks the senses. The squared structure, multiple facets of varying colors and surfaces, yards of channel trim, and wacko, uncomfortable handles on the broiler, oven door and service cabinet. Hard to keep clean, unpleasant to touch... And the looks - like fingernails scraping on chalkboard, while chugging a castor oil martini! The many years and service calls that have passed since that first encounter have somewhat tempered my revulsion. They are still ugly - no yielding on that - but I realize that the basic concept and layout remains true to that of the A, B/Z, and C. While Rangaire had obviously decided that a visual update was needed, it seems they were confident enough in the unique character and value of their acquisition to leave the basics alone. Let's see: I believe that the model A originates in the early 1920's, when American farms still had way more horses pulling plows than tractors. 40 years later with the model D, we are blasting off to the moon, yet the Chambers stove had not been significantly altered, avoiding the yearly "ALL NEW!" marketing path followed by every other appliance (and car) manufacturer for decades. Not abandoning Cooking With the Gas Turned Off (CWTGTO)? : gotta give Rangair some credit on that account. The electric version. Still ugly, more stupid. Designed (and written) by Yoda. Of course! Also, I must say that the D's oven safety system is quite impressive, in terms of functionality and well-built components. DANGER: If an electrical power outage occurs with the ThermoStat dial turned on and an "Auto Start" time selected, the loss of power to the Heater Valve Solenoid will open the Heater Valve, prematurely turning the oven on. Similarly, since electricity is required to close the Heater Valve (which turns off the oven when the ThermoStat dial is turned on), a power outage while "Auto Stop" is engaged prevents the oven from being turned off at a selected "Stop" time. (Cooking With The Gas Turned Off) is a feature of Chambers Ranges that is not to be confused with automatic timing devices becoming more widely advertised. There is not much logic in buying a fine refrigerator to preserve food and then leaving perishables in a room tempera­ture oven where the heat is not set to come on until 3:00 or 4:00 o'clock in the after­noon. With the remarkable Chambers method, no bacteria can develop because food starts to cook before you leave home; the cooking Finishes on retained heat and the Chambers oven and Thermowell act as sealed warming closets until it suits your con­venience to serve the meal. Cook the food first - the Chambers way - and play safe! Ha! Rangair thought it knew better. Looking back, their confusion - or cluelessness - made evident by the Model D, was the first, clear indication of the decline of the Chambers brand. Despite it's bizarre looks, increased complexity and ridiculous Auto Timer, the D for the most part inherited the same well thought-out functionality and build quality as previous iterations. Chambers purists may scoff at the fact that D's have electric controls (for the oven, if the Auto Timer is utilized), but beneath this and the D's visual changes, the heart of the same old Chambers is still beating. Sure, the oven's Auto Timer operation does require electricity, but its CWTGTO and conventional operations function safely and normally, by choice when not using the Auto Timer, or by default in an electrical outage. 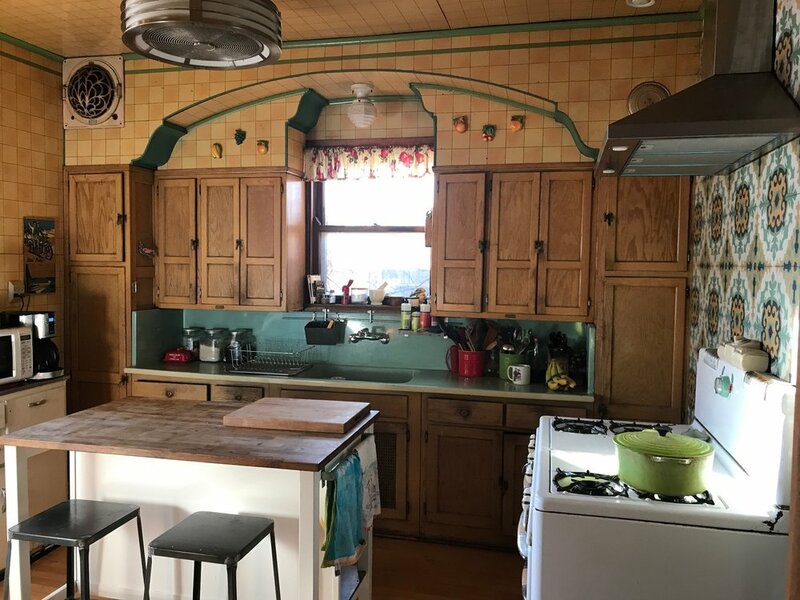 Would I have a D in my kitchen? Not a snowball's chance in a pre-heated ThermoWell, but if I run across one whose owner has requested some TLC, I promise to be polite and stifle any opinions I may have about their baby's looks. TECH HINT: Has your Model D oven stopped working? IE, does it refuse to light when you turn the dial on? If so, first be sure your oven's pilot is lit. If it is, there's a good chance your Auto Timer is malfunctioning. Try unplugging the stove's cord from the electrical outlet. You should hear an immediate "click" from inside the service cabinet. Unplugging the cord de-powers the Auto Timer and puts it into default "Manual" mode, which opens a valve between the oven thermostat and oven burner. A handy remedy when the Auto Timer switches start malfunctioning.